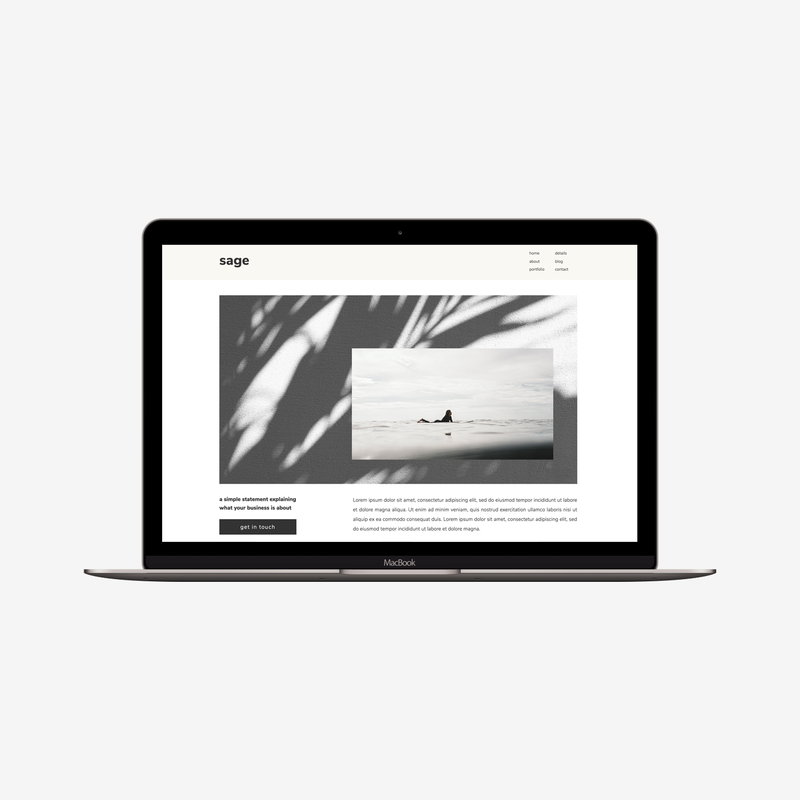 Phoebe is made with a stylish blog lady in mind but totally works great for photographers and freelancers with a beautiful service alike. Phoebe has a no-nonsense clean look and a casual cool girl vibe. Subtle neutrals and bold elegant fonts give a fresh and stylish radiance. Design your heart out with all the playful layouts you need. Your dream clients will flow easily through your website stunned by the clever high-end look that Phoebe is all about. Launch your fresh, lively and cool website today and make those dream clients fall in love! A fully customizable website template with blog design for the drag & drop platform Showit (exclusive Showit subscription). You receive a PDF file with the unique Site Key code. With this, you can upload the template (exactly like the demo) into your own Showit account. In the PDF file you also find easy step-by-step instructions. Upload the template to your own Showit account. Customize every detail of the template easily without code. Upload your content, hit 'publish' and your new website is live! Now all you have to do is let me know, so I can celebrate with you! You have 100% creative freedom without coding. You can easily restyle the template to match your unique business brand. Change logo, fonts, colors, layout, photos, everything to perfectly match your brand. This website template is designed for Showit and only works with Showit. You'll need a Showit subscription to launch this website. Check the faqs for more information about Showit. You don't need Photoshop, Illustrator or other fancy design tools. The templates are a digital product and are delivered immediately after payment. Therefore it is not possible to return the template and no refunds are available. Check the faqs for more information or read the Terms and Conditions. Have a question? Please check the faqs for more details or contact me. Showit is the most innovative platform for drag & drop website building without code. Drag & drop like you've never seen before. A Showit template can be completely turned upside down and 100% customized. No code. No hacking. No crying. Only big smiles! Your website looks great on all screens. The templates are fully responsive. Determine the layout, styling and content for mobile yourself. Blogging is done with the familiar WordPress. Showit handles all the tech stuff for you for free! Content power and WOW design come together seamlessly. Easy SEO with fill-in fields for titles, keywords, descriptions for each page. You can even optimize all website photos with keywords! Live chat with Showit experts and a Showit community where everyone helps each other. With the push of a button support for whatever you want to ask. Choose a template from the shop that suits your business, branding and personal vision. Upload the template to your own Showit account with the share key. Customize every detail of the easily. Upload your content, hit 'publish' and your website is live! Now all you have to do is let me know, so I can celebrate with you, cheers! Blogging is done with the familiar WordPress. Showit nerds handle all the tech stuff for you, for free! Content power and WOW design come together seamlessly. Live chat with Showit experts and a Showit community where everyone helps each other. With the push of a button support for whatever you want. is this your dream website? does it make you smile and happy dance? Click the button below and go for it girl!